Summerglow is known for its lovely colour transformation while blooming. This beautiful peony starts out with a soft peach colour that contains subtle hints of pink and soft yellow. During blooming, the petals pass a whole range of pastels, with salmon and orange predominating. 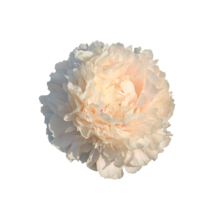 Summerglow is a full-petalled peony with bomb-shaped flowers, thick stems and voluminous leaves. The buds can grow to be a whopping 45 mm wide. The flowers are above average in size with a diameter of 15 cm. Summerglow was registered in 1992 by Hollingsworth. This variety is hard to grow and as such has a very limited availability. Make sure you order in time!